WAVE WASH - Voted "Best Car Wash" in Dallas by D Magazine! DeSoto – E. Pleasant Run Rd. Irving – N. Belt Line Rd. W. Dallas – Westmoreland Rd. 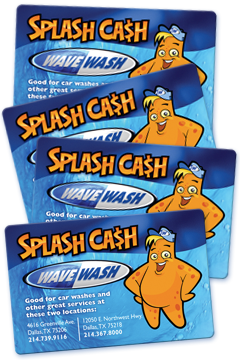 Make a Splash with our Wave Wash GIFT CARDS! Our SPLASH CASH cards make the perfect gift. VISIT YOUR LOCAL WAVE WASH FOR DETAILS.